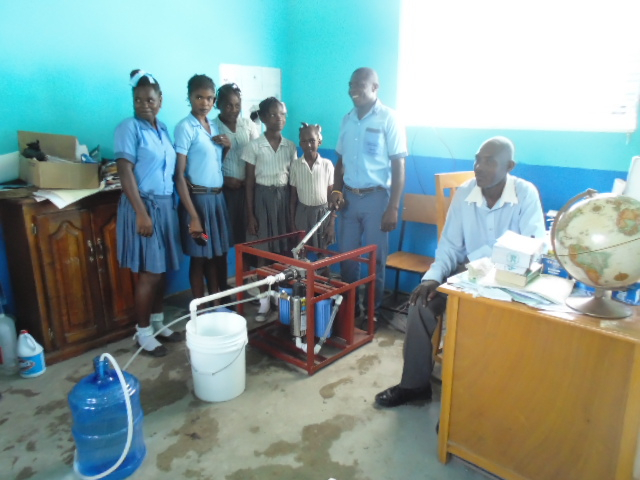 In conjunction with our partners, Digicel, the LGF Haiti team installed another of our LGF UV manual hand pump systems designed and built in Haiti by our all Haitian team at a College Nouvelle Vision school in Cavaillon. The system produces approximately 7500 liters per 12 hour day which can provide 2,500 people per day with clean drinking water (at 3 liters per day). The Principal (pictured here) is extremely happy to be able to now provide clean drinking water to his students and the surrounding community. This a a game changer and as the name of the school suggests, representative of a new vision for Haiti. This entry was posted in LifeGivingForce Foundation, Partners, Stories, Uncategorized. Bookmark the permalink. Post a comment or leave a trackback: Trackback URL.